At the very outset we want to congratulate our honorable course teacher Nazia Nabi to give me a chance to preparing a Feasibility Plan of a New Product or Development of an Existing Product. It has been a great honor for us to take part in such a prestigious opportunity. We express our gratitude to all the well wishers who supported us all the time with their helping hands. We want to market Green Coconut Water. We have prepared this feasibility plan on that basis. We have assigned a name for the product as “Jaul”. Since the raw materials are very much available in our country, we have decided to give the product an indigenous image. Jaul is a kind of soft drink that provides the consumers with processed green coconut water in bottles. For the marketing purpose of the product we have decided to launch three product lines. The Jaul would be launched in the market at 250 ml. 500 ml. and 1 Litre bottle. We have set a reasonable price for the product so that all kinds of people can afford to buy this soft drink. We have followed the Target Costing pricing approach. We would gain a competitive advantage, as this is a first hit in the market. We have targeted a huge market segment for the product. Bangladesh is a large populated country. Lots of people are looking for such a product. Green Coconuts are not available all the time. For example: a person walking on the street. Suddenly he feels thirsty. Now if he wishes to drink green coconut water he cannot find it easily. It is not always found in the right place at the right time. If we launch our product in the market, a person willing to drink green coconut water can have it from a nearby shop. At present this is not possible. Our target market includes health conscious people, sick people, sportspersons & many other consumers, which we have segmented from the Demographical, Geographical, Psycho graphical & Behavioral point of view. We have prepared a financial documentation for this feasibility plan of a new product. As we are introducing the product in three categories at 250 ml, 500 ml and 1 Litre bottles, we have prepared the Break-Even-Analysis for each of the product line. We have prepared the feasibility plan for five-year basis. For 250mls the break-even point is at 4158004 Units. That means if we sale 4158004 Units a year, we will make neither profit nor loss. So to make profit we have to create a market demand in such a way so that more than 4158004 Units are sold every year. Obviously the unit cost will eventually come down because of the law of Marginal Cost. Then the break-even point will also come down. But that is from the long run perspective. So initially we might suffer loss but ultimately we would earn enough profit. The consumers will first taste the product by consuming the 250ml bottles. So we might gain a short run profit from that. For 500mls the break-even point is 4914004.914 units per year. So we have to sell more than 4914004.914 units to earn profit. We know that after the product is well promoted, people will eventually consume more of 500mls, as pet bottles are more in demand. The price is such that people will turn to the 500mls because we are providing them at lowest possible market price. For 1 Litre bottles we have a different plan. We know many people are not going to consume the 1 Litre package. So we have assigned more profit on them per unit. Our target is to sell less quantity of products but achieving higher profit. 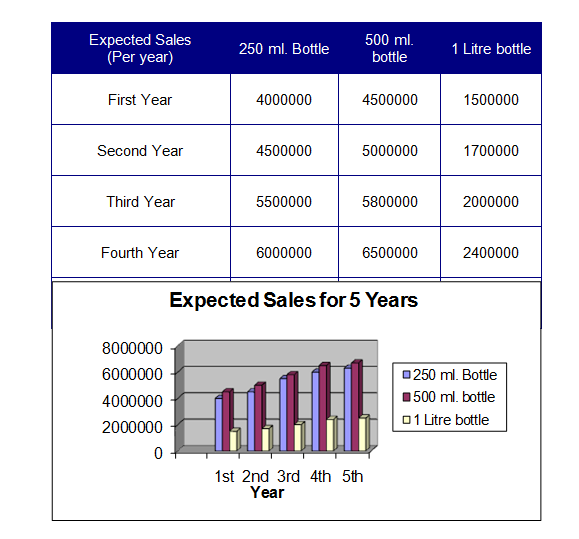 For 1 Litre bottles we have estimated the break-even point at 1724137.931 bottles per year. As we can see, we have prepared the selling price in such a way so that, to be in a profit earning zone we have to sell least amount of units comparing the other 2 product lines. We have given an elaborate discussion on financial summary at the later stage of the feasibility plan. We have followed the Target Costing Pricing Policy; which means an ideal price is set first based on customer considerations, then target costs will ensure that the price is met. We decided the market price before. Then we calculated the estimated unit price & fixed price. 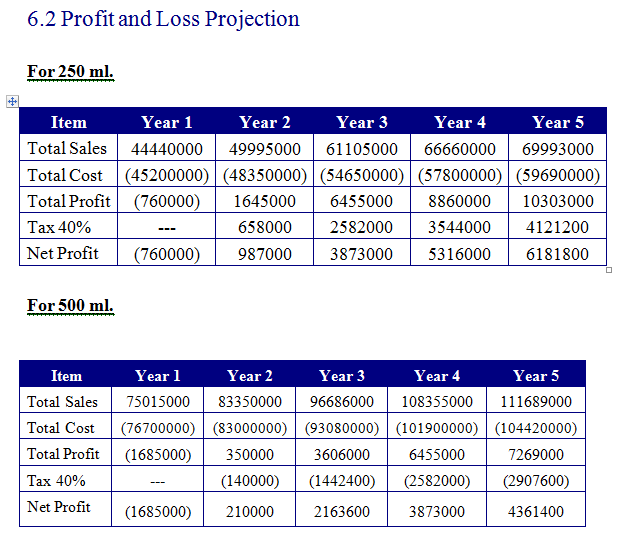 Then we decided how much profit margin is possible on each of the product line. We have assigned three different profit margins for three product lines. This price setting is based on the current market research. ‘Jaul’ is a product that serve different segment of customer. The product is green coconut water, which is unique in the current market. 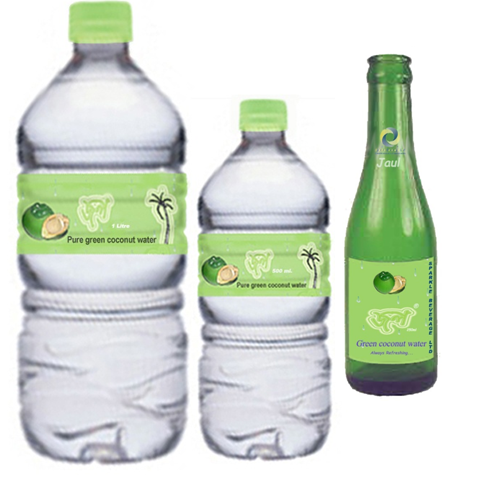 The green coconut water will be processed and sold in glass bottle of convenient sizes of 250 ml, 500 ml and 1 liter. The green coconut water will be very much refreshing and provide great support to the sick and health conscious people. Our target market is very large with different segments. Our expected sales are very high. The development cost is tk.2.5 million approx. Our company wants to develop and introduce a new Product. So, we have gathered information through in-depth interviews. We made a survey of the market to have a clear idea about our market, our customer demand, needs and wants. This information helps us to know about the current market and prospects of our new product. Bangladesh is a country of about 150 million people.. The total market size of the soft drink industry is about 20 million and day by day it is increasing. We have a spread nationwide market of different convenient product. People are nowadays very much concerned about the market and product conditions. So we have a growing prospect of customers of “Jaul”. Among the population we worked out few segments of customers who will prefer our product most. Analyzing all the segments, we decided our target market according to our product category. The target customers of “Jaul” are sick people, health conscious people, sportsmen and tourists. The company decided to charge Tk. 12 for 250 ml bottles, Tk. 18 for 500 ml bottles and Tk. 38 for 1 Litre bottles, if we consider price versus taste received then we can see that taste received is more in value. Therefore charging the mentioned prices are justified. 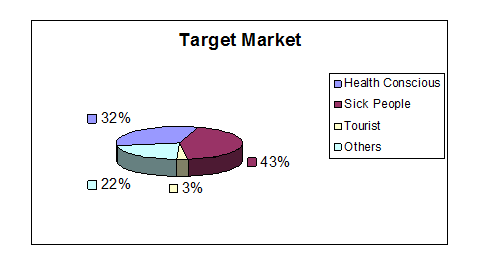 The following graph gives a clear idea of our target market. We separate our target market into four different segment based on their geographic, demographic, psychographic and behavioral characteristics. Health conscious: Health conscious people basically the sports person are one of our largest target market. In this segment, we get a lot of potential customer. One third of our total population is young. This is a significant number that we have to concern about them and provide product, which is fit for them. About 5 million people of this total number are health conscious. They spend about Tk. 500 in a month in average. Tourists: Every year a huge number of tourists visit Bangladesh. We want to provide them with “Jaul”. “Jaul” wants to satisfy its customers need. That’s why it is important to identify the market needs. Our first consideration is to provide the best product to its customers. That’s why we offer three different sizes of bottle with different prices for its different segment of customers. 250 ml : The lowest price for the rural mid social class and individuals. 1 litre : For a small family. Uncertainty of launching a new product. These companies can try to entrance our market by launching new product lines to compete us. Yet, we have distinct competitive advantage. That is our product is still brand new. The other companies will take sometimes to enter into the market. Till then we can have a monopoly market condition. The other advantage that we have is lower price. We will sell products in reasonably lower price then other competitors do. Our company has decided where it wants to position its market offering. We have chosen our objective to maximize market share. We believe that a higher sales volume will lead to lower unit costs and higher long-run profit. We have set the lower price because we assume that the market is price sensitive. Our overall objective is to capture the maximum market share by setting lower price. Each price will lead to different level of demand and therefore have a different impact on company’s marketing objectives. We have estimated the cost and want to charge a price that covers the cost of production, distribution and selling the product, including a fair return for its effort and risk. There are two types of cost: a) fixed and b) variable. In our new product development project fixed cost is 2,00,00,000 taka. Fixed cost includes- machinery, monthly bills, and salaries of employees and so on, regardless of output. There are some variable costs like-cost of bottle, packaging and so on. These costs tend to be constant per unit production. We have estimated that per unit variable cost is Tk. 6.3 for 250 ml, Tk. 12.6 for 500 ml and Tk. 24.4 for 1 litre. We have analyzed our competitors’ price and found that Pran charges tk.10 for 250 ml bottle, Starship charges tk. 12 for 250 ml Pac. We have chosen the target costing method to set price for our product; pricing that starts with an ideal selling price based on customer considerations, then target cost will ensure that the price is met. To acquire a strong position in the market, we need to give special emphasis on effective promotional activities. 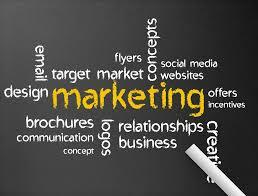 In order to get the maximum market share we will have to use all four tools of marketing promotion. Specially, advertising through mass media will support us a lot. We initially will give more emphasis on paper ads and TV commercials. Because, advertising through these media is the most effective way to reach the customers and position our product in their mind. We are anticipating that this will have a massive impact on the teenagers and other enthusiasts. Few neon signs and bill boards of “Jaul” also can be set up in some core points of the city. We hope to reach 75% of our customers through effective advertising. Though personal selling skill is not that much effective for convenient products like “Jaul”, we will inspire and train the sales persons of the retail stores to convince people to buy our product when they will come to buy any drinks item. The sales persons will inform the consumers about the cool refreshing taste of “Jaul” and about the nutritious aspects. We hope that will play a significant role to increase our sales. We have also planned to apply some promotional tools. Initially for sometimes we will distribute our product at 50% discount just make our new product familiar with the customers. This will be the market-testing period for our product. Later, we may apply the strategy of giving gifts, lucky coupons, tour tickets depending on the market and competitive situations. We have future plans to hold seminars, commit social development, supporting social activities, to arrange cultural functions and mobile game shows for publicity purpose. In the initial stage, we will distribute the products with our sole distribution channel. When our market will spread out, we will distribute our products through dealers. We will set our own outlets in few core market positions. When we will go for mass marketing, we will supply our product nationwide through dealers. Our dealers will take the products to every district of the country. “Jaul” will be available in all retail stores of the country. As we are targeting to the top most customer satisfaction and building long-term customer relationships, there is no alternative for us rather than providing top quality service. Giving the customers timely and instant quality service is our primary concern. We even planned to open few customer service centers where will response to customers’ interactions. We will collect information, suggestions, ideas and opinions of the customers through these centers and will innovate and modify our product accordingly. We also will change any defected product. We will set our manufacturing and other working areas in convenient locations. We will prefer the locations to set up our manufacturing firms, warehouses and inventories in different core business points of the country where it will be easier to both collect the raw materials and transport the final goods to the market. 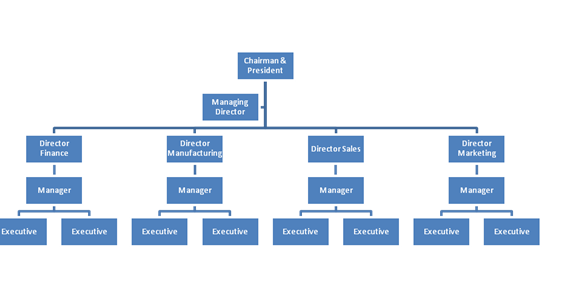 The board of directors will be responsible for the recruiting activities. Recruiting will be done through written tests followed by interviews. To create and innovate new quality products we need to use advanced technology. We need high tech machineries imported from the foreign countries. Not to mention, skilled people to operate them. We have already studied all the technical aspects and prepared a list of instruments and their costs. The machinery will be collected when required. Manufacturing and OperationsGeneral Customers: Besides the above segments, the general customers will acquire a significant portion of our target market.Sick people: Sick people are one of our major considerations. More than 1 million children suffer from diarrhoea that need liquid food. Not only child but also the adult might suffer from those types of problems.